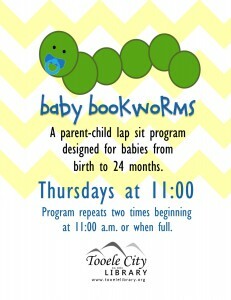 Baby Bookworms is a parent-child lap sit program using the 7 days 7 ways principles from Very Ready to Read. Designed for babies from birth to 24 months. This program is repeated 2 times and begins when full – or at 11:00 and 11:30. 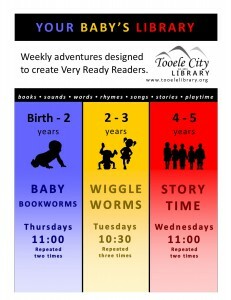 Children 2 and older can enjoy programs for their age groups such as Wiggle Worms and Storytime. Look for these in our calendar!